One common characteristic among the members of Team Kimberlin is a lack of musical talent. Rather than admit his inadequacy, The Dread Deadbeat Performer Kimberlin has tried to sue some of us who have commented on his musicianship. The TKPOTD from four years ago today dealt with his claim in his RICO Madness LOLsuit that my codefendants and I had tried to ruin his career. The Dread Pro-Se Kimberlin tries to claim that my 21 codefendants and I did all sorts of mean things to him to ruin his business. This is from paragraph 265 of his second amended complaint in the Kimberlin v. The Universe, et al. RICO Madness. Now, it is true that I have written a negative review of his musicianship. 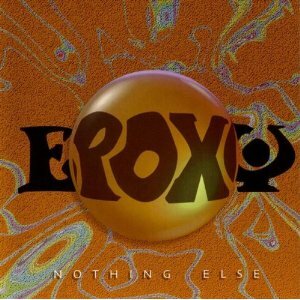 Back in 2002, Brett Kimberlin fronted a band named Epoxy and released a CD called Nothing Else. The story he spun promoting the album was that it contained songs that he had written while he was being held as a political prisoner in the federal prison system. The band consisted of Brett Kimberlin on guitar and vocals, Wade Matthews on Bass, and Robbie White on Drums. The genre of the album is someplace between grunge and punk, neither of which are among my favorite musical forms. Let me first comment on Mr. Kimberlin’s voice. I had heard his speaking voice in court, and I understand why some people refer to it as whinny. His singing voice reminds me of the silly voice that Weird Al uses on tracks such as Eat It. Mrs. Hoge, who listened through the CD with me, said, “Eddie Haskell.” On most of the tracks his voice was off key, usually flat. Most of the songs could have been filler tracks on a generic grunge album. Some of the alienation in them seems to be more appropriate for a 17 year old, not someone 30 years older. Mr. Kimberlin was in his late 40s when the recording was made. However, three of the songs stood out. Vicegrip was actually interesting musically. Donuts had clever lyrics. It’s about lousy prison food and would probably get a nod of approval from G. Gordon Liddy. While he didn’t do especially well with the acoustic guitar on Keyhole, Brett Kimberlin is actually a reasonably good guitarist. He probably couldn’t cut it in Nashville or LA, but could make a living in a minor market (such as Seattle) or playing the Holiday Inn circuit. Indeed, the world would be a better place if he did ignore the usual advice and give up his day job. Nothing Else by Epoxy (Pollen Records, $16.04 from Amazon) is interesting because of who recorded it, but I can’t honestly recommend it for the musical experience it offers. The original publication of that review resulted in Hogewash!‘s first Instalanche. There were probably more hits on that review over the next couple of days than on the jtmp dot org website for the next year. The Dread Deadbeat Pro-Se Kimberlin’s plan for brass knuckles reputation management wasn’t any better than his music. This entry was posted in Lawfare, Music, PLM, Team Kimberlin, Trolls and tagged Brett Kimberlin, Deadbeat Performer Kimberlin, Deadbeat Pro-Se Kimberlin, RICO Madness LOLsuit by wjjhoge. Bookmark the permalink. How can Brett Kimberlin be damaged as a employee of JTMP when he’s the sole owner of said tax dodge?